Yesterday was Pocky Day. It is a Japanese ‘holiday’ that celebrates the snack Pocky. The reason that the 11th of November was chosen as Pocky Day, is because the date consists of lots of 1’s, which are of course shaped like Pocky. The classic Pocky in its characteristic red package. 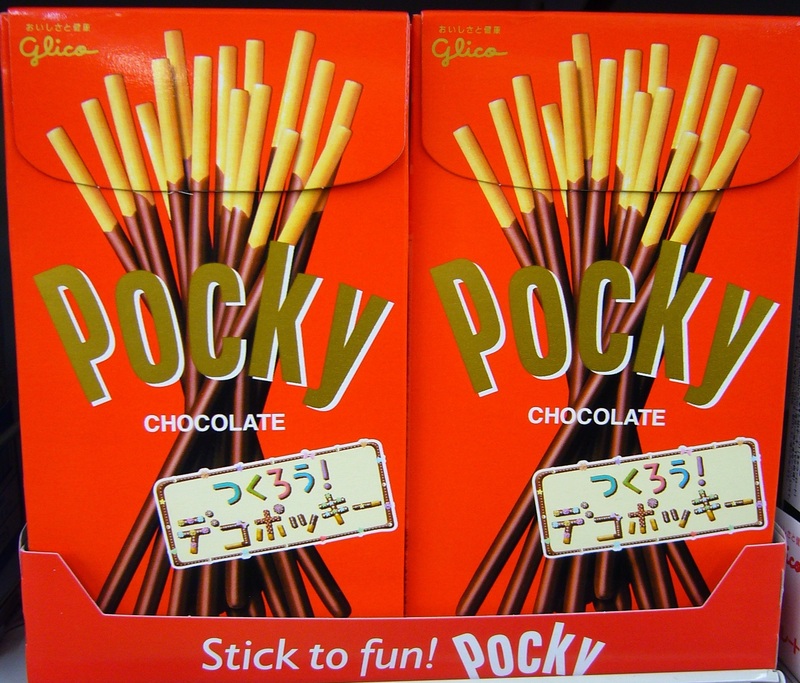 Pocky was first sold in 1966. As the popularity of the snack increased, new varieties were added. By now there is such an enormous assortment of Pocky available that it is hard to know where to begin. Below is a picture of the Pocky aisle in a standard supermarket. You can see that other brands have also tried to benefit from the success of Pocky, by making their own Pocky clone. This is my very inexpert attempt at merging two different photos to show you all the different kinds Pocky in a Japanese supermarket. There is a Pocky for every demographic. Strawberry Pocky for the ladies, extra thin Pocky in a simple package for the men, and some very interesting varieties with almonds and with salty chocolate that I unfortunately did not get a chance to try yet. Next time I’m in Japan, I will do my best to further explore the world of Pocky! Happy belated Pocky Day everyone! Strawberry Pocky. The hiragana reads ‘tsubatsuba ichigo’, which means strawberry with seeds. This is a classic, first offered on the Japanese market in 1977. 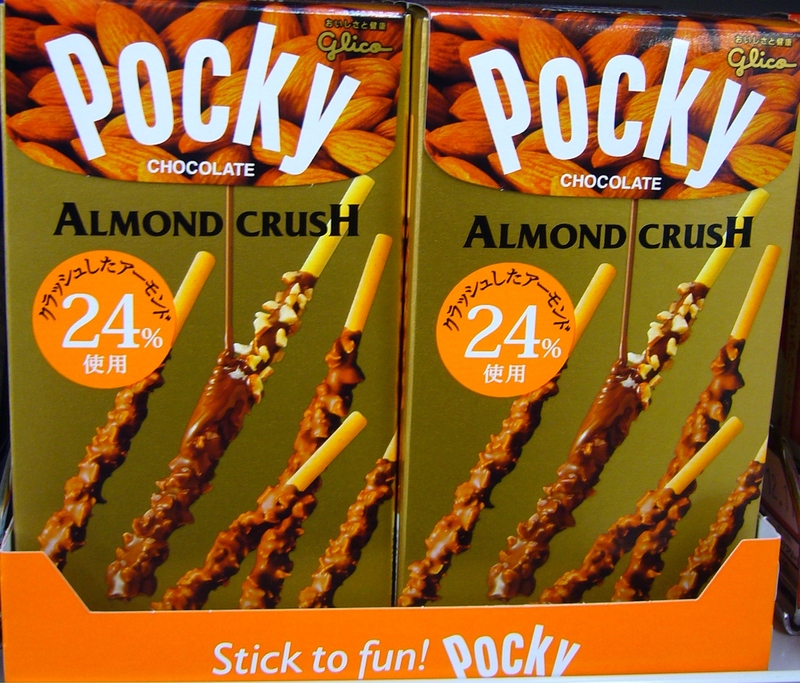 Almond crush Pocky. Looks yummy! According to Wikipedia, this is another classic. 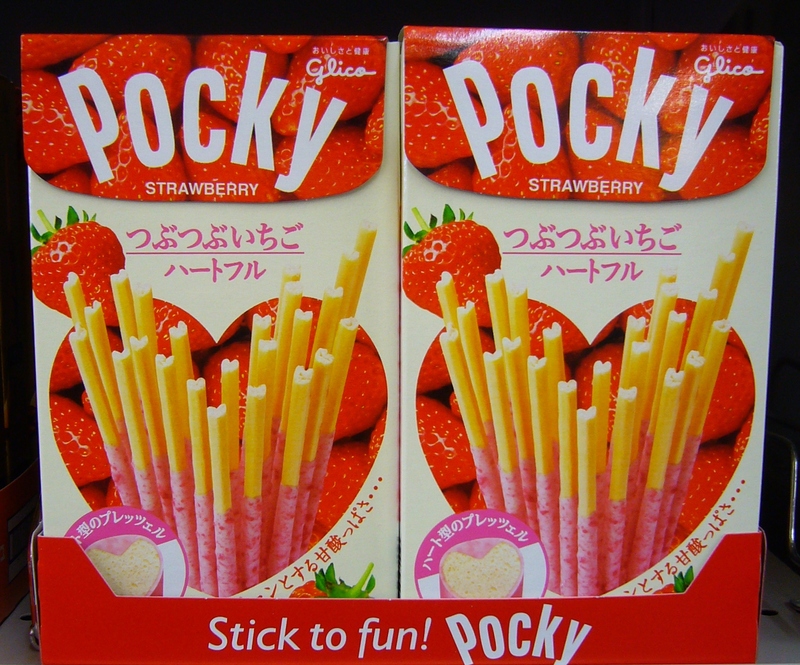 It was the first new variety after classic Pocky, developed in 1971. 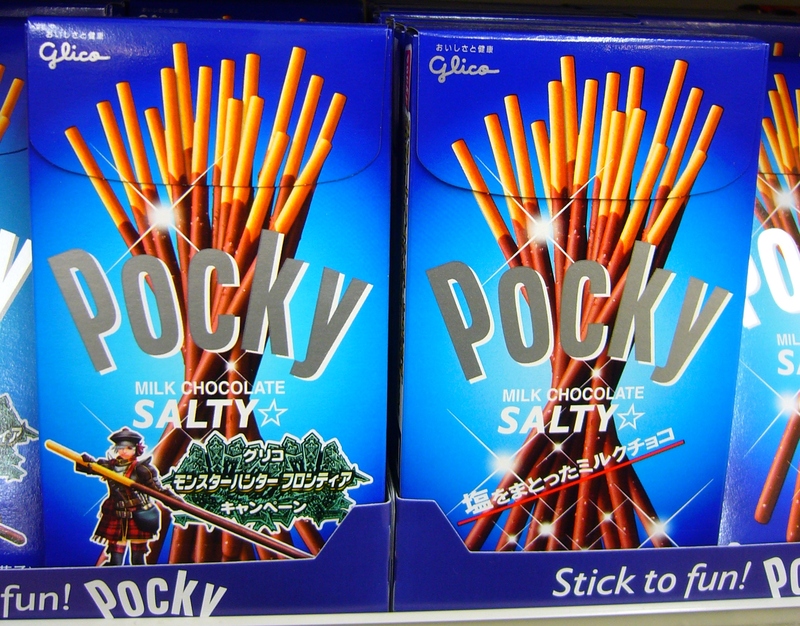 Salty milk chocolate Pocky. I’m really curious about this one. This entry was posted in Food, Japan and tagged Candy, Food and drinks, Holidays, Impressions of daily life, Marketing, Pocky, Snacks, Strawberry Pocky, Supermarket by Haruko-chan. Bookmark the permalink. i grew up with POCKY, though lived in south east asia. i loved them. i have since tried various flavors. but have yet to try that ‘salty’ chocolate ones. hhmm…. time to go back to japan? I also grew up with Mikado (the Belgian name for Pocky). Only one flavour though. I don’t really like sweets that much, so I didn’t try much Pocky when I was in Japan. There is so much interesting food to try in Japan that one year is far too short to try everything. lol. i completely agree. no matter how long the trip one has when visiting japan, there will never be enough time to try all those awesome food. especially when it comes to their snacks. A permanent snack in my pantry. Haven’t tried the salted Pocky! Chocolate with salt sounds like an interesting combination, doesn’t it? Unfortunately, I haven’t tried them either. Haha, the name took a little getting used to for me too. But now I think it sounds cute. I just looked up where the name Pocky comes from, and apparently it comes from the Japanese onomatopoetic word pokkin (ポッキン). It refers to the sound that Pocky makes when bitten. I almost bought some Pocky last week. It was for sale in a little shop near Grand and Wilshire in downtown LA. Next time try some! Was it the regular kind or a special one? I don’t remember… I’ll get it next time! Happy Pocky Day! I love the original chocolate but the tsubatsuba ichigo is also very good. There is a new winter Pocky in Japan called “Fuyu no kuchidoke” which is also very good! It has a thick chocolate coating and is delicious. You can make your own Pocky in the Glico factory (Kitamoto, Saitama) somewhat near my house. However, it is so popular that it there is a waiting list of over 6 months!! I didn’t know they sold it in other countries. Funny enough “Mikado” is a type of biscuit at home (Ireland). I didn’t know that you can make your own Pocky. Interesting! It sounds like a lot of fun ^_^ I think mine would be with almonds and salty caramel. Unless that exists already in the vast assortment of Pocky’s that is out there at the moment. I had tried the normal and berry flavored pocky in Tokyo! They were quite tasty. Do you know if pocky is a Japanese brand? Or is it like kitkat, an international brand that the Japanese loved end extended to many flavors? I believe Pocky is a Japanese brand, produced by the Japanese company Glico. Pocky was later exported to many other countries. In Belgium, Pocky is called Mikado, but the logo still contains the company name Glico in small letters. So I imagine that even with the different name, it is still owned by the Japanese company.